From the safety of its burrow, a plasterer bee takes a peek at the bug geek with a camera. Last week my neighbor decided to spruce-up her lawn and she hired a landscaper to mulch the flower beds. The flower beds in question happen to boarder my property and unbeknownst to the landscapers, May is the month hundreds of plasterer bees emerge from nesting sites in my yard and engage in aerial high jinks in the flower beds next door. Confronted with hundreds of bees buzzing wildly above the ground, the traumatized landscapers were all for fleeing the scene or breaking out the bug spray. Fortunately, a timely explanation by my wife reassured the workers and my neighbor that these wonderful bees were docile and harmless. The renovation proceeded without incident. 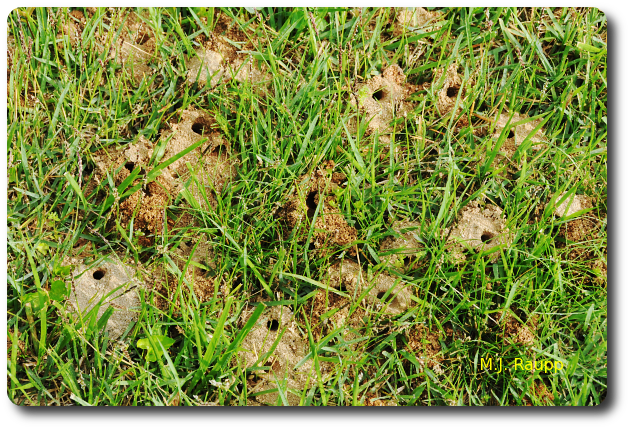 With sandy soil and a little luck, you too can have hundreds of plasterer bees colonizing your lawn. Plasterer bees, a.k.a. cellophane bees, belong to a family of bees known as colletids. Colletids are relatives of honey bees and bumble bees but unlike their cousins, these bees are solitary. Rather than living in a communal hive shared with mom and the sisters, each female plasterer bee constructs a subterranean gallery of her own to serve as a home for her brood. 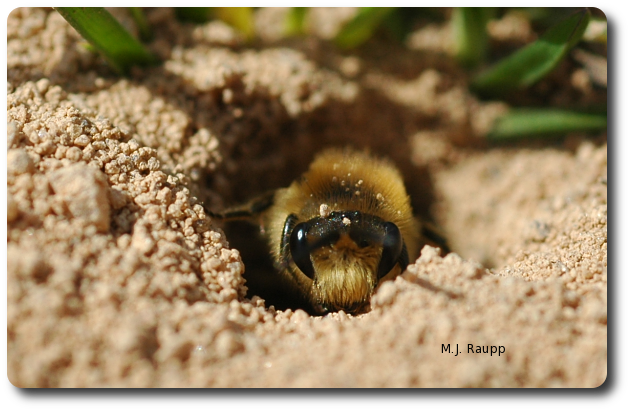 The interior surface of the burrow is lined with a thin, glossy, translucent material produced by the bee. The habit of coating galleries with a cellophane-like material gives this bee the common name “plasterer bee”. The coating waterproofs the interior of the chamber and likely inhibits the growth of fungi. This is vital to the success of the brood that will develop within the gallery. Along a central tunnel leading into the ground, small brood chambers are constructed. Under good conditions, mom can build a new brood cell each day. Brood cells are provisioned with a semi-liquid concoction of nectar and pollen from flowering plants. Female plasterer bees lay eggs in the well-stocked brood cells and eggs hatch into small bee larvae that consume the yummy delight in each chamber. The bee babies develop during the growing season and emerge next spring to repeat the circle of life. With a full load of pollen on each leg, down the hole she goes. Plasterer bees are important pollinators of several native plants. Right now, they can be found in the tree tops pollinating apples, hollies, and tulip trees. They seek nesting sites in sandy soils with thin vegetation. Since this is the exact definition of my lawn, I was fortunate to have plasterer bees move in several years ago and my bee colony has gown exponentially ever since. If you should see swarms of small, hairy or metallic bees constructing or emerging from galleries in soil of your garden or lawn, resist the urge to annihilate them. Several families of native pollinators such as digger bees, yellow-faced bees, halictid bees, and our friends, plasterer bees nest in the ground. Enjoy the antics of these beauties and give them a break. They pollinate plants and keep our planet humming. We thank Barbara and her landscaping crew who inspired this episode of Bug of the Week. The wonderful book Food Hoarding in Animals by Stephen B. Vander Wall was used as a reference.